Hiiraan University fundraising ceremony, the first of its kind, was held at the Loews Denver Hotel in Denver, Colorado State on October 08, 2005. 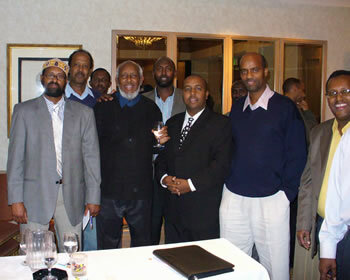 All segments of the Somali Community of Colorado attended the event. Representatives from various segments of the community and community leaders spoke at the event. More than fifteen thousand dollars ($15,000) was raised for Hiiraan University. On behalf of the Hiiraan University Foundation, Professor Ahmed M. Warfa of Utah, the keynote speaker at the fund-raising, acknowledged the unfailing effort of the Somali community of Colorado for the good gesture. The fundraising project for the establishment of Hiiraan University will continue throughout the United States, Canada, Europe, Middle East, Australia and Africa. HU Board of Directors would like to thank the Somali Community in Colorado for their generosity and giving toward the worthy cause of educating the children in Somalia. Hiiraan University is the first of its kind in the Hiiraan Province and is intended to provide university education to the high school graduates from the various schools in the province and in other parts of Somalia. It is therefore, committed to train all Somalis, with necessary qualifications.